Last night, U.S. District Judge Philip Brimmer denied the Justice Department's allegation that Kenneth Scott's sidewalk counseling efforts at Planned Parenthood in Denver make it "unreasonably difficult" for patients and employees to get to the clinic. If the Justice Department had proven that Mr. Scott was guilty of their charges, he would have been saddled with a preliminary injunction that would have kept him 25 feet from the driveway. Instead, Judge Brimmer, stated that Mr. Scott is a “sensible man” as he ruled against the injunction. The process for yesterday’s hearing and the subsequent $10,000 Federal law suit coming later this year has been grueling for both Kenneth and his attorneys. The Federal Government has a battery of lawyers working to protect the abortion industry in Colorado from the truth. If not for the diligent, self-sacrificing work of Rebecca Messall, along with Peter Breen, Tom Brejcha of the Thomas More Society out of Chicago, the outcome yesterday would have been very different. Mike Wagner, head security guard for Planned Parenthood was a witness against Ken Scott. A video that the government produced as evidence was intended to show that Scott was dangerous, when handing out literature to cars entering the abortion facility’s lot. The video shows Kenneth handing a client an information packet and Wagner driving up behind the vehicle stopped in the driveway. Mr. Wagner testified that he felt “frightened and concerned” when he couldn’t get into the driveway. The incident lasted ten seconds and no police report was filed. Wagner carries a gun and has extensive military training. He’s a former police officer and now serves as the head of security for the entire Rocky Mountain region Planned Parenthood operation. It makes one ponder what seeing a Planned Parenthood client receiving an information packet could possibly make him panic? Even Judge Brimmer, while explaining his ruling, expressed his doubt about the former police officer’s credibility. For these reasons, Mike Wagner is the reluctant recipient of “Best Hostile Witness of the Day” award. When questioned by Scott's lawyer, Mike Wagner, said he wasn't aware of any fender-benders because of Scott. Ironically, there was quite a wipe out two years ago during a snow storm as Mr. Wagner raced around the corner at Planned Parenthood and plowed into two cars. Both of the cars belonged to pro-lifers who were praying across the street from the abortion facility. Ken Scott’s witnesses were exemplary. Binette Bah in particular, caught the attention of the court when she entered the room to testify with her four year old daughter. Cute little Binette was heading to the witness stand following her mom but had to be directed to sit in the gallery. The entire courtroom watched as she stood in her seat to see her mommy. On the witness stand Binette was asked how she knew Ken Scott. “I met Ken Scott at Planned Parenthood the day I went for an abortion.” Before Binette finished her testimony she instructed the people in the courtroom to look at her daughter and said, “If it weren’t for Ken Scott I would not have my daughter today.” When Binette left the witness stand little Binette ran to her mom and hugged her. It was a sweet sight to behold. KPOF, a local Denver Christian radio station, has consistently invited Ken and Jo Scott to their program for almost a decade. KPOF hosts, Roy Henchke and Denise Washington Blomberg, told Ken that since they have been broadcasting the events at the abortion mill their listeners view the pro-life ministry differently than they had in the past. The audience has invested their prayers in the ministry and they are genuinely concerned about the welfare of the sidewalk counselors. 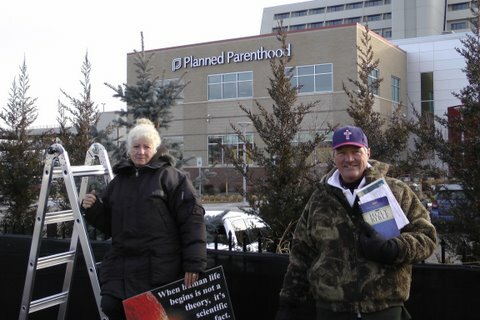 No longer does the Christian community view the pro-lifers at the abortion mills as judgmental, aggressive or hateful. KPOF is changing the world for Jesus and helping to save the lives of innocent baby boys and girls while offering a very important outlet for the truth to be shared. The U.S. Justice Department, under Barack Obama, is targeting free speech outside of abortion mills in at least seven states. In doing so, they are jeopardizing the lives of thousands of children and their moms. Do not be deceived, free speech everywhere is at risk when the government decides who is allowed to speak and where that government approved speech is allowed to take place.